Those who smoke are often criticized for their choice. Most smokers know that smoking increases their chances of stroke, cancer, bronchitis, and heart diseases. However, the US American Cancer Society says that around 70% of smokers have the desire to quit, while only 40% put it into action each year. The pleas supervision for quitting smoke from friends and family is often not enough. Smoking is addictive and quitting is not easy. However, for those who really want to quit, there are many quit smoking apps out there that are meant to encourage you to stay away from cigarettes. 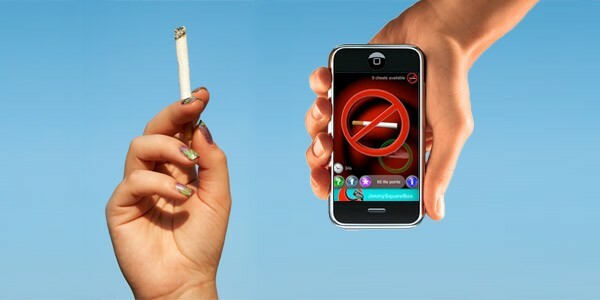 The first quit smoking app is QuitPal. 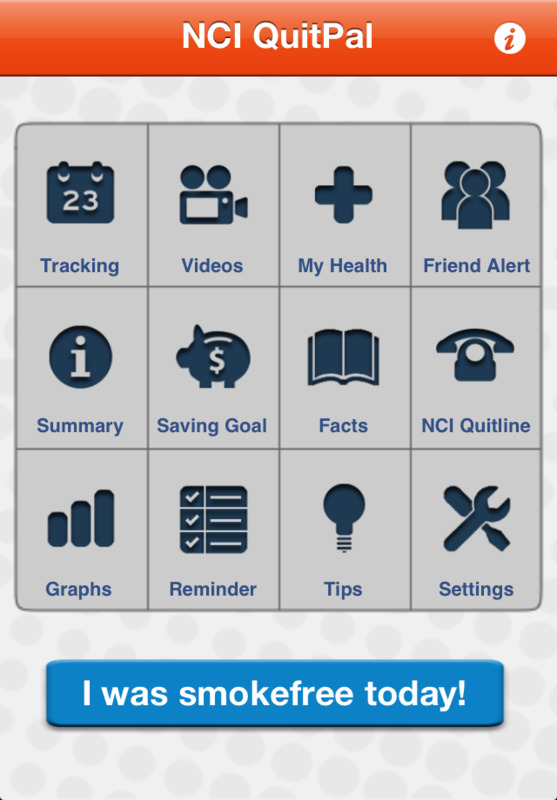 Based on scientific research, the National Cancer Institute developed this app to help people quit smoking. Along with having a calendar function to keep track of their success, the app also utilizes social media that allows the user to post updates to tell others, involving friends and family, how well he is doing. There are also graphic features showing how much money has been saved by giving up packs of cigarettes. Also, there is a video diary function that allows friends and family to leave encouraging messages to support you to keep on. This quit smoking app motivates you by keeping track of exact how many days, hours, and minutes it has been and how much money has been saved since your last cigarette. It provides you WHO-based information to show how your health has improved and the achievements list you have and haven't unlocked since stopping smoking. This app is very social that not only associated with Facebook, Twitter and other social networks but also allows you to create your account on it and chat with other quitters. There are 44 language options that allow you to get support, help and useful tips from others in your own language. This app allows you to personalize your quitting approach. You can quit at once, or you can gradually decrease the amount of nicotine you are using. Either way, this app will keep up with the changes. There are budget alerts showing you just how much money you have saved by quitting smoke while achievement badges will reward you for all the efforts and progresses. In addition, through the built-in social circle, you can get support and update your Twitter and Facebook about your recent developments. 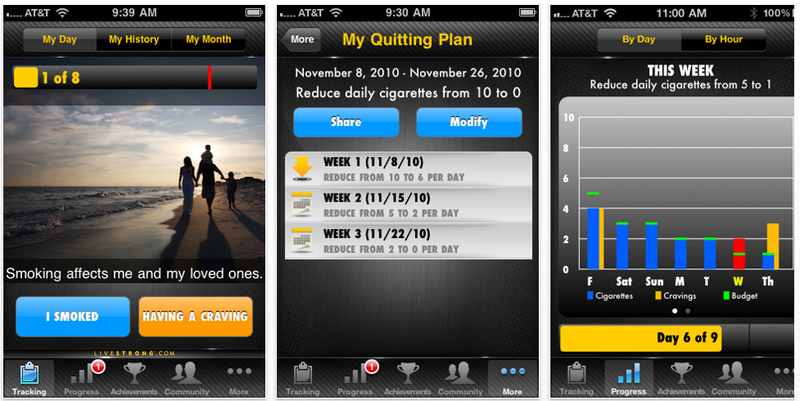 This app is based on a 21-day smoking cessation program that was developed at Yale University. 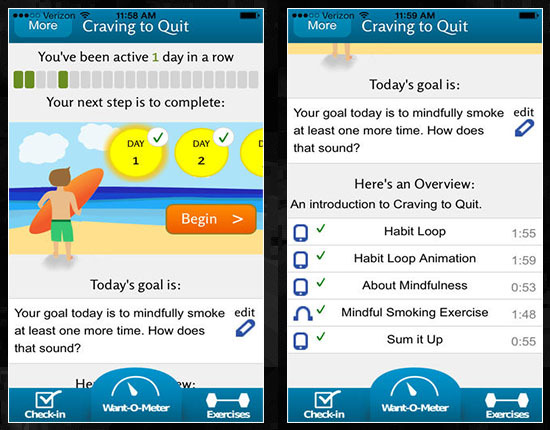 Within the app, you will find daily instructions through audio & visual tracks and goal-setting tools to coach you throughout the quitting process. The idea is to get you to gradually decrease your nicotine intake until you are not smoking at all. With this app, you will receive a full array of tips on quitting smoke and you can also contact the associated doctor for help. This app can be dated back to 1999 and is one of the first that has proven to be useful. 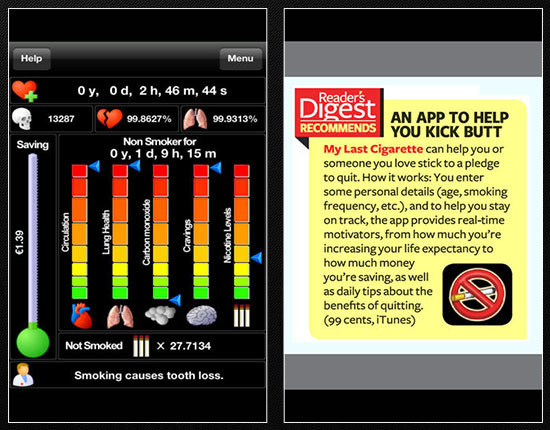 With this app, you can get readouts of what you have saved by quitting. These readouts include how better your health is, how much money you have saved and the time that you have added to your life. These figures are meant to be motivation to encourage you to stop smoking and ensure that you do not pick cigarettes up again. NHS Stop Smoking app is meant to help you go through the first month of stopping smoke. Every day, you get updates on how much money you have saved by stopping smoking, the time that goes by without cigarettes and useful messages to help motivate you to stay smoke free. In addition, the app provides successful quitting stories which can help to motivate those who are trying to stop, as well as connecting you with others who have stopped smoking with this app. This app is built to show you what you have not done since you stopped smoking. This is the opposite of what most apps show. It shows you the cigarettes you did not consume, the tar you did not take in, the money you did not put on nicotine products. With these figures at hand, you will see real benefits of quitting smoke and be determined to keep with it. This app works as a way to help you track how healthier you are becoming, how much money has been saved, as well as providing a strong support network so that you can stop smoking and stay cigarette-free. In addition to this, there are games for you which are helpful during a time where cigarettes may be wanted. It also connects you with others who have quit successfully, as well as those who are working on quitting now. With such a supportive network, you have a larger chance of giving up smoking for good. 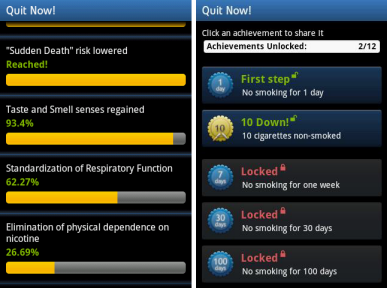 This quit smoking app has self-help and confidence-boosting program. 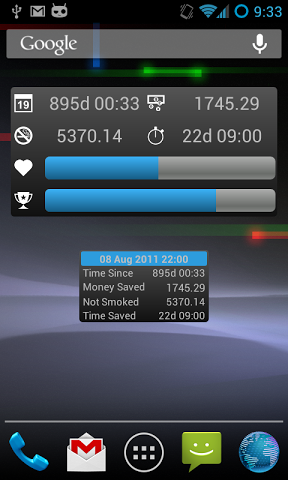 It is an inspirational app that is meant to inspire you to change habits in order to stop smoking. For example, Johnson helps you to realize in what situations you may feel like smoking and how to better deal with these situations. By doing this, you can relax and tackle the issue of smoking much easy.